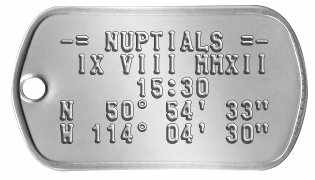 Give these nuptial dogtags to your groom and he will have no excuse to not be at the right place at the right time! The date in Roman Numerals provides a touch of class and the church co-ordinates can be typed into his GPS. Customize to Buy your Wedding Date Dog Tags now! 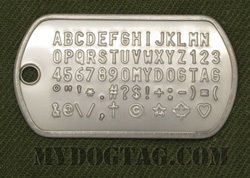 Dogtags make great bridal souvenirs and wedding favors, especially for military themed weddings! Perfect for recognizing and thanking members of your groomsmen bridal party, or as wedding favors for each of your guests. All orders are shipped within 1 business day and are usually delivered within 1 week (in North America). If you need any assistance creating or ordering your Wedding Date Dog Tags please contact us directly, we are here to help!